Break out the fighting sticks and oil up your thumbs, Capcom has one last version of Street Fighter IV in the works. In June, Capcom released Super Street Fighter IV: Arcade Edition, an update which added four new characters (bringing the game's total to 39), a host of balance changes, new online modes and a certain teenage duo that would quickly enrage fans with their god-like fighting skills. 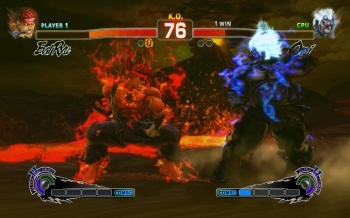 At the time, Capcom fighting game guru Seth Killian claimed that it would be the final update for the three-year-old Street Fighter IV. During this weekend's EVO fighting game tournament in Las Vegas, Capcom announced Super Street Fighter IV: Arcade Edition Version 2012. Not much is known about the update, though Capcom hinted at numerous balance changes for the title. Unsurprisingly, fans are hoping SSFIV:AE2012 will bring with it a few new characters -- I've got my fingers crossed for bouncy grappler R. Mika, African Capoeirista Elena, or the Street Fighter debut of a certain Metro City mayor -- but so far nothing has been officially announced. What Capcom has officially stated however, is that this is the final Street Fighter IV update. Seriously. For reals this time. Capcom wouldn't lie about a thing like that, right? As with Arcade Edition, the update will debut in Japanese arcades, before making the jump to America, and then to the Xbox 360, PlayStation 3 and (presumably) PC versions of the game. Again, there has been no word on when this might happen -- I'm guessing sometime in 2012 -- nor what sort of pricing structure the update might see once it's available for home consumption. With so much uncertainty regarding this update, now is the perfect time to speculate wildly on what it might include. Have a favorite character you'd love to see in the game's pseudo-sumi-e art style? Have an idea for a stage you want to punch people through? Have a plot in mind for how Capcom might rebalance this fighter yet again? Don't bother pointing out that Yun is wildly overpowered. At this point it's a universal constant, like gravity or Chun-Li's massive thighs. Ssfiv ae balance patch coming in fall or winter, will be free! Free is a great price, but that kills much of the hope for new fighters. At least until Capcom needs to make some quick scratch and reveals the next update, anyway.